I hit the one in Meridian first, near the intersection of Eagle and Franklin Roads. Smashburger does something interesting to set themselves apart from the pack: they have a partially individualized menu for every state they're in. In our case it's the Idaho Smashburger, which consists of potato chips, cheddar cheese, lettuce, tomato, onion and mayo on a potato bun. As a kid, I liked doing things like putting fries or chips in my sandwich or on top of my burger, so I figured it was worth trying. Since my burger didn't come with pickles, I decided to forgo the usual side and try the Fried Pickles. My girlfriend opted for the Classic Smashburger (American cheese, lettuce, ketchup, onion, pickles, and "Smash Sauce" on an egg bun...usually there's tomato as well, but she don't like that) and Smashfries. God, all this branding gives me a headache sometimes. Anyway, they packed our food into very sleek, grown-up appropriate black boxes. I was pleasantly surprised by my burger. The bun was really good (I'm having lots of good luck with hamburger buns lately), and they had put pickles on in spite of the menu description. The onions were red (my favorite), the lettuce was dark and leafy, and the potato chips were of the kettle variety, thick enough to remain crunchy despite the heat and moisture. The fried pickles, on the other hand, were just too much for me. I had assumed that given how salty and tangy pickles are to start with, a mild batter would be used, but this stuff had a very strong flavor to it. I tried them with some of the accompanying ranch dressing, hoping the creaminess would mellow the whole thing out, but all it did was add another layer of seasoning. If you're the kind of person who likes a level of seasoning that would send most mere mortals running for the nearest toothbrush, these are for you. I tried some of my girl's Smashfries too, which are the same as their normal fries but with the additions of olive oil, rosemary and garlic. The end result was strongly flavored but much more bearable than my side dish. All in all, I wished I had gotten the standard fries. On a prior trip to this restaurant, I had tried the Veggie Frites, a side dish of asparagus spears, carrot sticks and green beans flash-fried. They were a nice alternative to fries but at a 50% markup, which I wasn't willing to pay again since my previous batch only had one asparagus spear. Literally just days after this trip, Groupon put Smashburger up as their daily deal and I picked up a $10 voucher for $5. This time, I decided to hit the Franklin Road location just west of Milwaukee Street. The Idaho Smashburger had been good enough that I was tempted to get that again, but for variety's sake I chose the BBQ, Bacon and Cheese, with standard French Fries this time. There was still a little room left on the voucher, so I ordered a Häagen-Dazs chocolate malt to go along with my meal. The BBQ burger is comprised of barbecue sauce, applewood smoked bacon, cheddar cheese and haystack onions on an egg bun. One look at this thing and I knew that it was going to be delicious but that about halfway through it I would be sorely craving vegetables that weren't deep-fried. I was absolutely right, after four or five bites I was wishing there was some lettuce or tomato to break things up a bit. The haystack onions were a little oily for my taste too, but I made it through with the help of my chocolate malt. The malt was delicious as well but not malty enough, but then again no chocolate malt is ever malty enough for me, so the problem is likely with me. After my last Smashburger experience the regular French Fries were delightful in their simplicity, crispy, golden brown and dusted with sea salt. When all is said and done I'll likely return to Smashburger again, but will be much more likely to do so if I come across another coupon or discount voucher. They're good, but they're just not one of the first things that pops to mind when I'm craving a burger (that would be Five Guys when I'm craving the gut bomb, Fuddruckers when I'm craving the exotic, or of course homemade). 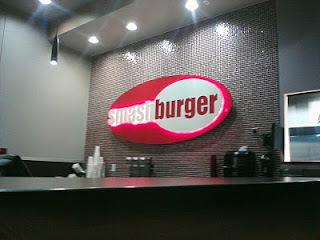 Smashburger to me is more of a novelty, something for the occasional change of pace, but good burger options are always nice to have around. Before you said you'd be grabbing a groupon coupon before going back to 'Smashburger,' TVT, I was gonna suggest you look out for discounts before eating there again. Why? The price of their non-Big burgers is $5 to $6 bucks. They don't offer specials that include a burger with fries and a drink. So, if you want those items the smallest fri and drink will cost you about another $4 bucks for a total of about $10.00 dollars for one meal for one person. Let's see how often you and your family, you and your date or even you alone can eat there at those prices. The hamburglar never looked so bad. On April 4th, 2011, Smashburger's Founder and Chief Concept Officer was in Boise to launch his version of the Bronco Burger and announce "Smashburger has released its new specialty 'Bronco Burger' in Boise - the only location in the country where burger lovers (and BSU Bronco fans) will be able to order it." pppffft! The Bronco Burger has been being served almost as long as their have been Boise State Broncos. Not only are the burgers served by the SUB dietary service to students, staff and visitors of BSU, the burger is a favorite of Bad Boy Burgers2 on W. Fairview in Boise, of Wheeler's Handout in Nampa, Of Buster's Good Time Sports Bar & Grill in Eagle and The Galley Downtown Boise Cafeteria. The Bronco Burger is part of Boise and has been around a long, long time. It was more than bold and arrogant of Smashburger to claim they created the burger and that Boise residents and BSU fans could only get it at their restaurant. Due to their high prices, unoriginal, greasy recipes, and dishonest business practices, I predict they will get a less than big bite of the burger. I'll agree that a lack of combo meal options makes Smashburger less cost effective, but that's pretty standard for non-fast food places. I was at Fuddruckers just the other night, where a bacon cheeseburger with fries and a shake cost over $10 even IN a combo meal. Bronco Burger from Smashburger: Angus beef, Applewood smoked bacon, Frank's Buffalo Sauce, blue cheese, lettuce, tomato and mayo on an egg bun. Bronco Burger from Wheelers: 1/3 lb patty with choice of sauteed onions, mushrooms, pickles, tomatoes, special sauce, ketchup, mustard, mayo, Swiss cheese, smoked Gouda and American cheese on a Tuscan roll. Bronco Burger from Bad Boy Burgers: Two 1/4 lb patties, Swiss cheese, American cheese, mayo, lettuce, tomato, pickle, special sauce and grilled onions. There are two or three other places in town who do a Bronco Burger as well, and I'd hazard a guess that theirs are different as well. I think what Smashburger meant is that you can't go to their Minneapolis location and order a Bronco Burger.